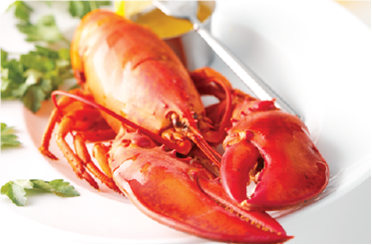 Cape Breton is recognized globally as producing the world's best lobster and at Island Sunset Resort's private Lobster Pound you can experience lobster like nowhere else! Sit on our waterfront licensed patio and enjoy a casual meal of fresh lobster, snow crab, mussels, shrimp, scallops, sandwiches, chowder prepared fresh for you while you enjoy a cold beverage and watch the waves roll in. 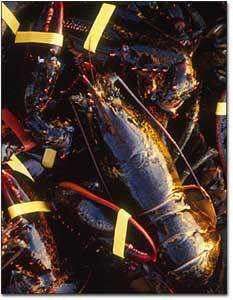 Lobster Suggestions from our Chef! Add wine to the pot and reduce heat by 1/2. Add whipping cream and reduce again by 2/3. Start whipping the butter into the mixture one cube at a time until each is melted. Add the first 6 cubes slowly and add the remaining cubes faster. Add lemon juice, salt & pepper and enjoy! be glad to prepare them for you!!! "We thoroughly enjoyed three nights at Island Sunset and should have stayed longer. From the comfortable cottages with the magnificent view of the ocean, watching the owner Wayne and his men building a dock, chatting and laughing with them, then Wayne inviting us to tour his lobster warehouse operations, welcoming smiles at the front desk, watching the sunset from your own porch in comfy Adirondack chairs, to the amazing lobster and crab dinners from the Lobster Pound - where you can feast on two lobsters one night and a lobster and pound of crab meat on the next night for a total of only $35 per person - total for both nights! Prepared and delivered with a smile to your personal cottage!! Oh, yes, the desserts from the Restaurant - big and deliciously decadent! The only place we will stay on Cape Breton. Thank you all for a wonderful visit. Ron and Rose"